Gov. Chris Christie hasn't done a TV news interview or spoken at a Trump rally in a month. What happened to Trump's most prominent endorser? 1) The official answer from Christie allies is that he's busy. He's fighting with Assembly Democrats to push a state takeover of Atlantic City, and he just made a deal with Senate Democrats to fill a long vacant seat on the state Supreme Court with a Democrat. After campaigning for president for much of his second term, he's now catching up on some unattended business — as if he's clearing out Trenton's clogged gutters. As evidence of Christie's renewed commitment to his day job, he's paying less attention to the day-to-day warfare of the presidential race. Asked on Monday about The Boston Globe's much-publicized mock front page about "President Trump," Christie said he had no idea what the reporter was talking about. 2) Endorsing Trump has damaged the governor's reputation. Christie's Trump endorsement turned Christie into something of a national laughingstock, particularly on social media. There was the press conference on Super Tuesday where Christie stood next to Trump and was mocked for looking like Trump's hostage or slave. "Chris Christie" was the number one trending topic on Twitter after that — and not in a good way. 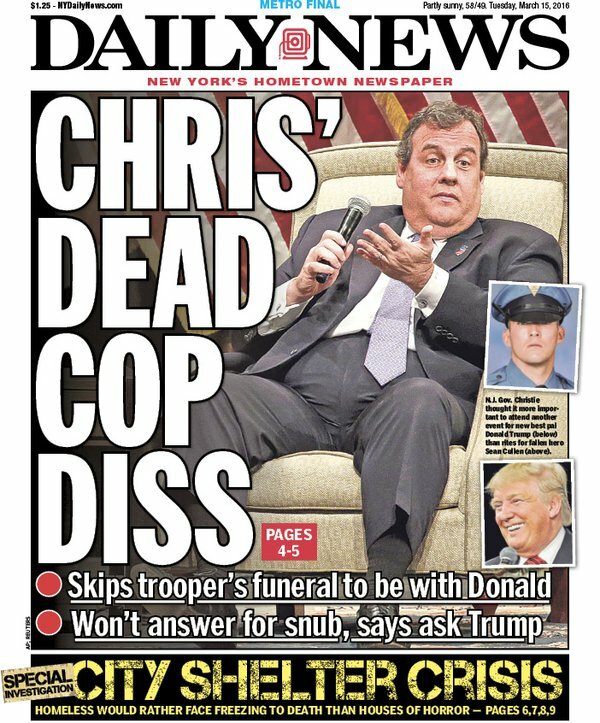 Then, Christie skipped a state trooper’s funeral to attend Trump rallies out of state, which resulted in derision from New Jersey police officers and two days of disparaging front pages in The New York Daily News. Christie has also had trouble answering for Trump’s most outrageous statements (aka, Trumpsplaining), while fellow GOP politicos, locally and nationally, have openly criticized Christie's endorsement. After all of this, Christie said that he'll only take one Trump question per press conference from now on. When a reporter last week tried to ask a second Trump question, Christie said: "Can’t hear you. Sorry. Loss of hearing." 3) Christie can't help Trump in New York — it's all about New Jersey. Despite the proximity and the governor's near-universal name recognition in the Empire State, Christie isn't expected to campaign for Trump in New York before next Tuesday's primary. It’s unclear how the governor could help, anyway — Trump is soundly winning, and Christie isn't necessarily popular enough to do any good. But Christie is helping with the June 7 primary in New Jersey. This could be the first consequential New Jersey presidential primary since the Democratic race in 1984. Scheduled on the last day of the primary calendar, the election could determine whether Trump secures the nomination. Bill Palatucci, Christie's political adviser, said that Christie’s team has interviewed all 51 committed delegates for Trump. They are "locked and loaded" and ready to back Trump, he said. That means that not only will they support Trump if he wins the popular vote in the state, as they'd be required to do, but if there's subsequent rounds of delegate voting at the convention, these delegates would likely stay with Trump even though they'd be free to back other candidates. Thanks to Christie's blessing, Trump is also getting endorsements from most county Republican committees in New Jersey, which means his name will have the best position on most ballots. As a delegate himself, Christie himself will actually be on the ballot, at the top. But not as he once dreamed: Next to his name it’ll say "Donald Trump, Make America Great Again."